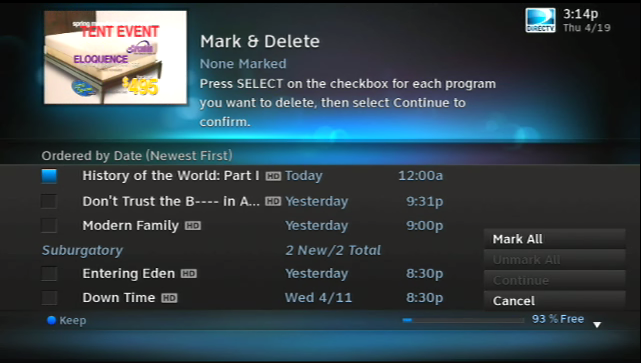 You might remember “Mark and Delete” as a useful function that was built into DIRECTV DVRs starting in about 2005. It let you delete a whole bunch of programs at once without having to go through the “are you sure” nag screen every time. For some reason this helpful tool didn’t make the cut when DIRECTV went to the new Genie menus. That’s why I’m showing you the version from the old menus in the photo above. It’s just… not there anymore. You can’t even get to the menu where it used to be. It’s not hidden in some other part of the menu system, it’s just missing. For those people who record an awful lot of things and then don’t watch them, it’s a bit of a drag, I get it. I mean, you can still delete an entire folder of shows at the same time, but you can’t go through and massively clean out your DVR like you used to. Well, you can but it’s going to take time. I’ll admit, it seems kind of weird that they took out this feature at more or less the same time that they gave you 2TB recording capacity for the first time with their Genie 2 DVR. It seems like this would be the time you’d really need something like this when you realize that you could have about 400 hours of HD programming, potentially 800 programs, all on your DVR at the same time. Choosing what to delete in a case like that is a pretty tall order. You have to hope that this is a feature that they will slide back in when they can. I know that the new Genie GUI isn’t completely finished, and it’s been a very slow rollout with a lot of people who still haven’t gotten it while bugs are squashed. I wasn’t an incredible fan of the way things worked in the past but at least you could do a Mark and Delete type function on the DVR. In the meantime, though, there’s a better option than all that button-pressing and it’s simply to use the DIRECTV app for smartphones and tablets which gives you a lot more intuitive way to manage your playlist similar to the way you manage your phone’s home screen. Hopefully that works well enough for you. Can you use a diplexer on a SWM-30?